Each year, hundreds of organizations support United Way of Northwest Louisiana by running a workplace giving campaign. Participation is not just a way for companies to show their community support. By allowing your coworkers to pay their pledges through payroll deduction, you empower them with the ability to help dozens of agencies for only a handful of dollars a week. A workplace campaign takes place over a set period of time. Company coordinators and employee campaign coordinators encourage employees to give to United Way of Northwest Louisiana. With United Way staff’s full support, a campaign can be planned and executed within one day, a week, a month, or whatever suits your company. United Way staff can customize a campaign to any type of company, making it fun and engaging regardless of the number of employees or number of locations of your organization. A single campaign makes the most of company resources. Doing good in the community is good for business. Working together to make a difference builds rapport among employees. Payroll deduction and credit/debit cards make giving easy. United Way funded programs are monitored to ensure high ethical standards are met. We connect businesses with human services that your employees may need. Without a doubt, workplace campaigns are the most high-profile United Way fundraising activity, representing a significant portion of the funds we gather to invest in changing community conditions for the better. Running a campaign where you work is a great way to get involved with United Way of Northwest Louisiana. Workplace campaigns are about far more than just collecting funds. They also bring much needed awareness to local workplaces. Each year we come together to raise the substantial resources needed to create progress in our four areas: Education, Health, Essential Needs, and Financial Stability. In the process, we focus our philanthropic efforts on effective strategies that actually solve our community’s biggest challenges. Having employees work with United Way provides employee growth opportunities and builds teamwork within your organization. It also brings together employees from all levels and departments who might not otherwise have the opportunity to work together, thereby fostering a stronger, more cohesive and more motivated work force. Your support is acknowledged in United Way materials and at public events, gaining you positive exposure for your efforts. You benefit from an enhanced community image which can help your marketing and employment efforts. Supporting United Way not only provides a means for your employees to give, but an opportunity to volunteer and learn about services they, or someone close to them, may need. Your employees may benefit from services provided by United Way funded programs, creating a stronger, healthier work force. 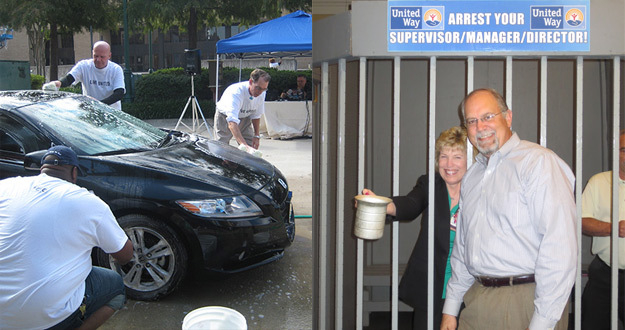 Supporting United Way is fun – boosting employee morale and increasing job commitment. 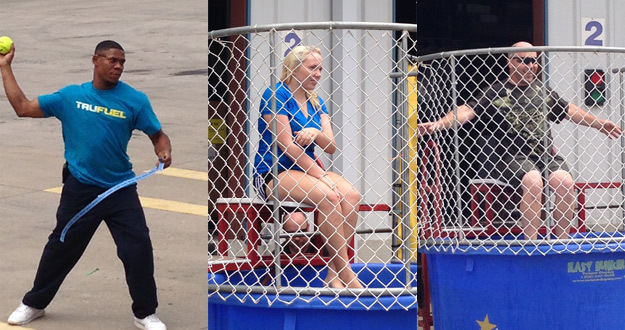 Calumet Packaging has an annual cookout with games for their employees and even has a dunking booth to raise funds for United Way. Since United Way funds are raised and invested locally to create lasting change, the money you and your employees contribute is a direct link to the community, making it a better place to live, work and do business. Ninety-nine cents of every dollar stays in Northwest Louisiana and $0.83 goes to programs, making United Way giving extremely efficient. United Way of Northwest Louisiana is creating real, long-lasting solutions by targeting specific goals. United Way is able to forge partnerships, focus resources and unite the community to tackle the root causes of problems. We’re changing the way our community operates by uniting people to create a lasting impact. Our end goals are specific and results are measurable. Learn more. Work with your company, respecting your time, work environment and culture. Help your employees understand the impact their participation makes and why your company supports the community through United Way. Provide all the materials you need from posters and brochures, to pledge forms and presentation speaker. Deliver campaign materials and pick up your pledge forms. Sam’s Town Hotel and Casino always has fun events for employees to participate in including Arrest your Boss, Kiss the Pig, a car wash and more to support their workplace campaign. To start a workplace campaign, contact Charnae McDonald at Charnae@unitedwaynwla.org or by calling 318-677-2504 ext. 161.